"Eye-Ai" Japanese Entertainment & Culture in English | Riverfield Co.,ltd. 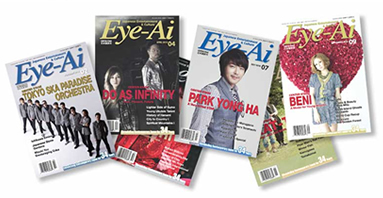 Japanese Entertainment & Culture "Eye-Ai"
Eye-Ai is the only monthly publication in English devoted entirely to Japanese entertainment and culture. Published in Tokyo for almost 35 years, Eye-Ai brings readers up-close-and-personal interviews with Japan's top entertainers and celebrities. What's more, content covers everything from enka to J-Pop to hip hop, with a generous amount of space dedicated to on stage and behind-the-scenes entertainment news. Get this month's news and views of popular artists, trendy dramas, hit TV shows, exciting stage productions, and the hottest concerts, not to mention the latest in fashion, travel destinations, cultural trends, and contemporary society—you are sure to see what you love in Eye-Ai! Usually an in-person interview of an individual or group, Center Stage highlights some of the top stars in the Japanese music industry. Music genres covered are J-Pop, rock, hip-hop, enka, soul, R&B, kayokyoku, and minyo folk songs. You never know who or what will be next in this dynamic and varied six-page offering that includes many photographs, upcoming tour dates, and sometimes a message to Eye-Ai readers. Here we give you a chance to meet up-and-coming music talent or, alternatively, the opportunity to find out what so-and-so is doing now, years after their peak in entertainment. Often you'll be delighted to learn that the individual or group is still active, though maybe on a smaller scale. Check Entertainment Eye to find out when and where you can see performances by newer as well as more mature celebrities. One of the most loved features of Eye-Ai is Sandy Ito's signature Spotlight in which she tells us of headline-making marriages, divorces, debuts, and astonishing goings-on in celebrity news. You won't want to miss anything in here. We are always happy to hear from readers and friends with story ideas and requests! And if you would like to submit a story for consideration, please e-mail us and let's talk! 2010© Riverfield.inc. All Right Reserved.